A chariot arrives before the King. Out steps the lovely Abigail. Although the King greets her warmly she can hear and sense chaos around her. James is on the run, but the King does not tell her. James is soon captured and realizes this is not the King’s men. Abigail approaches him and tells him she wants to help him. She knows he loves Snow. She understands and does not love him either. Abigail and James arrive in Midas’s realm. He questions her motive for helping him. She tells him she is in love with a man named Frederick and they were once supposed to marry. James tells her that Snow does not return his feelings. Abigail takes James to a shrine where a knight made of gold stands. He is impressed by how life like it is and she then explains that is because the knight is Frederick. In battle Frederick had stepped in to defend Midas. The cursed King Midas accidentally turned him to gold and there he stands. Nothing can break this curse but Abigail believes there may be hope if she can get water from a magical lake. She explains to James the lake is guarded by a deadly creature and no one ever defeats it. James vows he will face the creature so at least one of them may be happy. She wants to go too but he tells her he will go alone. James approaches the lake and summons the creature. A beautiful blonde woman emerges. James tells her he will not fall for her tricks and knows she is a siren. The Siren challenges him by transforming herself into Snow. He knows this is not real but finds her hard to resist as she stays in the form of Snow trying to kiss him. He finally gives in and loses grip of his blade as it slips into the water. He gains his composure and stops her. She is impressed as she tells him he is the first and quickly pushes him into the water. Underwater James sees skeletons and tries to escape. Vines come alive and hold him down. The Siren finds him and kisses him. He finds his blade and stabs her. As she dies the Siren transforms back into the blonde. James brings water to Abigail. She is excited. She pours the water over Frederick’s head. He transforms back into a living breathing man. She cannot thank James enough and encourages him to seek out Snow White and fight for her. James is inspired and leaves. We now arrive at a familiar scene in the forest where James runs into Red. This time we see more. Red tells him that Snow does love him and had set out to stop his wedding. At this moment the King shows up. James and Red take off by horse. David and Katherine are having a tense dinner. She has news for him. She has been accepted into law school…in Boston. She wants them to move. 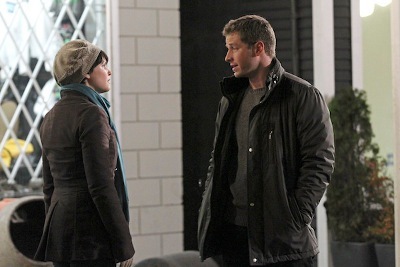 He meets up with Mary Margaret. She wants him to come clean with Katherine. She tells him he must make a choice. Emma runs into the Stranger. We find out his name is August. She then goes into the diner and meets up with Mary Margaret. Thinking she is confessing her sins to Emma, Mary Margaret tells her about the affair. Emma tells her she had already figured that one out. She tells Emma that David is going to end things with Katherine and tell her about them. David comes home to find Katherine looking at places to live in Boston online. He tells her this is not working and she should move without him. He does not come clean about his affair with Mary Margaret. I see Henry and apologize for tearing down the playground. I remind him it wasn’t safe and present him with a portable video game as a gift to make up for the loss of his book. He mentions he wants to see Emma. Just then Katherine come walking into my house and is visibly distressed. I tell Henry I will see him at dinner. Katherione cries to me that David does not want to make their marriage work. I tell her about the affair. She is stunned. I mention pictures Sidney had taken that I didn ‘t show to her because I wanted to protect her. She wants to see them. I show her pictures of David and Mary Margaret kissing. Katherine blows up at me and tells me I am not a friend and leaves. David speaks to Mary Margaret on the phone. He tells her he left Katherine, but does not admit that he left out the part about the affair. Just then Katherine arrives at the school and slaps Mary Margaret in front of the students and anyone else in the area. She then finds out David has not been honest with either of them. August arrives at the diner and picks up Emma by motorcycle for a date. They go to a wishing well. August tells her that there is a legend about this well. The water comes from a lake where anyone who drinks the water will get back something they had lost. They drink the well water. Mary Margaret is now being treated as the town tramp. She even finds David cleaning the word TRAMP spray painted in red off her car. She is mad at his lack of honesty and breaks things off with him. Emma returns from her date centered around water and it’s magic to find a mild flood that only surrounds her car. She finds a box in the water and it is Henry’s book. August watches her hidden around the corner. Katherine comes back to see me to apologize. I am agitated when she tells me she wants to give up on David. She realizes they are not in love and she should move on because she also wants true love. At first I am upset but quickly think of a way to make this work for me. I encourage her to leave Storybrooke… I later use my keys to get into her house and steal a letter she has left for David. Emma meets up with Henry on a bench. She gives him his book back. He is excited but warns I will be there soon to pick him up. She then goes back to the apartment to find Mary Margaret sulking in bed. She wants to comfort an unresponsive Mary Margaret.